Bring an ancient practice home with this kit that makes three soy wax lavender candles. What do the ancient Romans, hipster apothecaries, and you have in common? A love of candle-making, of course. 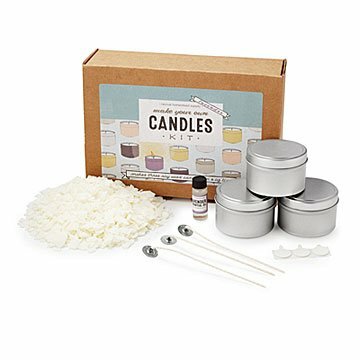 This simple kit has everything you need to craft three lavender candles including: soy wax, essential oil, three tins, and three wicks. You'll just need a saucepan, thermometer, and three pencils to balance the wicks while the candles cool. A soothing gift for crafty friends, it brings a lovely glow and calming scent to any space. Assembled in Northampton, Massachusetts. A natural educator with a knack for crafting, Melody Figge is the owner of a storefront in Western Massachusetts where she teaches classes and provides supplies for fermenting, canning, and making other products to use at home. Wanting to better reach those beyond of her neck of the woods, Melody now also creates DIY kits that make her simple, useful projects accessible to more people than ever before. Each kit is designed, packed, written, and illustrated by Melody herself, demonstrating her desire to foster meaningful connections through everyday actions. Approximately 32 hour burn time per candle. Kit makes (3) 6 oz candles. This makes a great gift! It was easy to make, look pretty and smells fantastic.